The River Corridor Foundation of St. Charles developed its first master plan in 2003 and has been actively fulfilling and updating the vision driving it – to make the Fox River a community centerpiece. In 2016-17, the foundation updated the master plan, creating, in the process, the Active River Project. The plan was the result of extensive public discussion and input from residents, civic groups, business leaders and government participants. 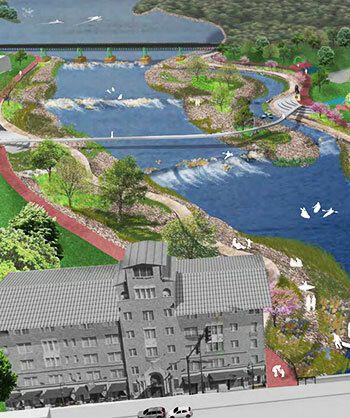 From this information, an exciting strategy was created for the redevelopment of the downtown corridor of the Fox River. The Foundation has been following the plan’s guidelines and the results are reflected in restoration and stabilization of the shoreline, expanded walkways, public art and new landscaping.